Brace yourselves for you are bound to experience the darker side of the grunge sound… Hard rock, alt-metal band Alice in Chains are trekking the live concert scene once more. And yes, they'll be making their way on to this side of the woods for a show at the Queen Elizabeth Theatre on Wednesday 10th April 2019. Legions of devoted fans are now on a mad hunt for tickets. Well, the good news is, you can be chained to your seat and still get your hands on tickets to the show. 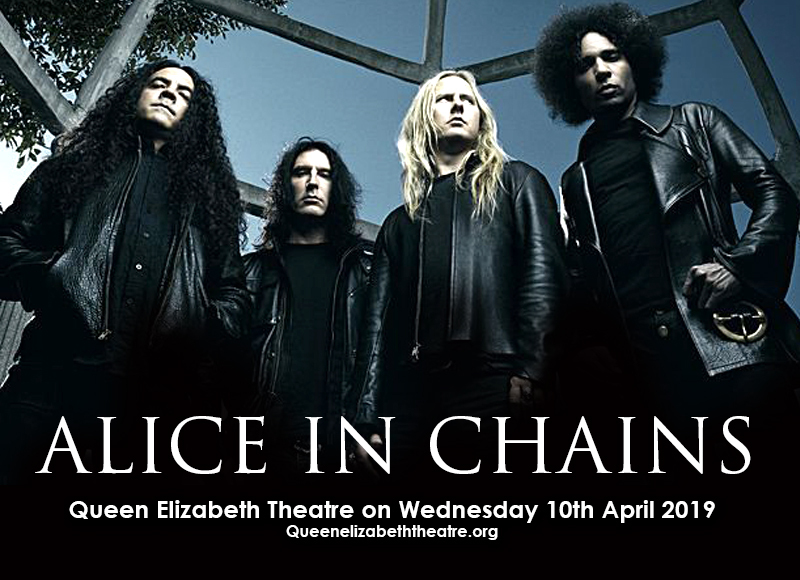 Click 'buy tickets' now and secure your space on the ground where Alice in Chains will unleash a sonic explosion. This is one of those wild jams you wouldn't want to miss. Get your tickets now! In the brewing grunge movement in Seattle back in the late 80s to early 90s, Alice In Chains was a band that stood out like a sore thumb. They were part of that era but was taking on a slightly different direction. There were elements of grunge all right, but fans and music critics sensed a mad alchemy of hard rock and metal that could detonate at the ripe time. Most bands from that era well, faded with the times. But still standing and moving forward is Alice in Chains. Their live shows these days show a diversity of fans in terms of age, proof that the band has kept their staying power and their music is timeless, boundless. Alice In Chains has so far, only released five studio albums to date, out of a career spanning two decades. Their most notable smash hits include: “Would?”, “Rooster”, “Them Bones”, “Angry Chair”, and “Down in a Hole”. Don't blow this chance of catching them on tour. Get your tickets to this insanely incredible show!